Spring Creek Medical Center provides premier chiropractic care in Logan, Utah. Looking for the best chiropractor in Logan, UT? At Spring Creek Medical Center, we provide the best chiropractor available in Providence and Logan, UT. We may very well be the answer you’ve been looking for. Our process begins with a thorough exam and review of your health history. We will then recommend a program that is specific to your needs and condition. Chiropractic care is the science of locating areas of joint dysfunction that is caused by muscle imbalance, muscle spasms, tension, or injury. Our chiropractic adjustments are carefully directed and controlled pressured impulses that restore spinal joints and extremities to a more normal position and motion. Learn more below. At Spring Creek Medical Center, we provide the best chiropractor available in Providence and Logan, UT. We may very well be the answer you’ve been looking for. Our process begins with a thorough exam and review of your health history. We will then recommend a program that is specific to your needs and condition. Chiropractic care is the science of locating areas of joint dysfunction that is caused by muscle imbalance, muscle spasms, tension, or injury. Our chiropractic adjustments are carefully directed and controlled pressured impulses that restore spinal joints and extremities to a more normal position and motion. Call or click below to get started. Basic understanding of the human nervous system will also help you better understand how chiropractic medicine works. The nervous system is the control center of the body, with the brain controlling everything that happens in the body. The brain sends nerve impulses throughout the body through the spinal cord. Since the spinal cord is so important to the overall function of the body, it is protected by the spinal column. The spinal column needs to move and adapt to your movement and is made up of several individual bones called vertebrae and are each separated by flexible discs. The spinal column also contains nerves that extend from between the vertebrae and transfers messages throughout the body. Chiropractors understand that when the spine is perfectly aligned, these nerves can send messages without interference. Sometimes vertebrae will get pulled out of alignment. This misalignment can happen after an accident, at birth, poor posture or even from everyday stress and tension. When the vertebrae are not aligned correctly, they pinch the nerves that they should be protecting. When a nerve is pinched, the messages that the brain is sending to the body experiences interference and causes the body to malfunction and can cause pain or discomfort. and why you should choose Chiropractic medicine. How Does Chiropractic Medicine Work? Thus cause the body to function better as a whole unit. At Spring Creek Medical Center, we use a brand new digital X-ray to locate our patients’ subluxations. Once the misaligned vertebrae are located, our chiropractor uses his hands to adjust the vertebrae back into place. The chiropractor will limit the amount of force applied to the back and neck to make the gentle adjustment. Choosing Chiropractic care in Logan, UT gives you another conservative alternative to treating pain symptoms. Most patients who receive chiropractic care after an injury or chronic pain symptoms will begin with a vigorous treatment schedule that includes a couple of visits per week. After several weeks of this aggressive therapy, you will visit fewer times per week in order to train the vertebrae and muscles to hold the adjustment on their own. Once you have recovered from the injury or pain, our chiropractor will recommend a periodic visit to help head off any new problems before they become painful. This is known as preventative chiropractic care, which is very beneficial. Focusing on disorders of the musculoskeletal and nervous systems, chiropractic therapy is used to treat back pain, neck pain, tissue injury, pain in the joints of the arms or legs, headaches and injuries resulting from auto accidents (just to name a few!). These conditions are treated by our in-house chiropractor, Dr. Steven Garvert, D.C., through a variety of methods including spinal decompression, physio and manual therapy, and therapeutic and rehabilitative exercise. Dr. Garvert also has broad diagnostic skills and provides nutritional, dietary and lifestyle counseling. Dr. Garvert treats patients from Logan to Providence and all over Cache Valley. Choosing Chiropractic care in Logan, UT gives you another conservative alternative to treating pain symptoms. Most patients who receive chiropractic care after an injury or chronic pain symptoms will begin with a vigorous treatment schedule that includes a couple of visits per week. After several weeks of this aggressive therapy, fewer visits will be suggested in order to teach the vertebrae and muscles to hold the adjustment on their own. Afterward, periodic visits are recommended by our chiropractor once you have recovered from the injury or pain. These visits will help anticipate any new problems before they become painful. This is known as preventative chiropractic care, which is very beneficial. Chiropractic therapy focuses on disorders of the musculoskeletal and nervous systems such as back pain, neck pain, tissue injury, pain in the joints of the arms or legs, headaches and injuries resulting from auto accidents (just to name a few). These conditions are treated by our in-house chiropractor, Dr. Steven Garvert, D.C., through a variety of methods including spinal decompression, physio, and manual therapy, and therapeutic and rehabilitative exercise. Dr. Garvert also has broad diagnostic skills and provides nutritional, dietary and lifestyle counseling. 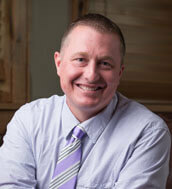 Dr. Garvert treats patients from Logan to Providence and all over Cache Valley. Meet with Dr. Garvert today! Dr. Garvert is happy to answer your questions and help you determine if our chiropractic care services are a good fit for your conditions. Schedule an appointment with Spring Creek Medical today if you are looking for one of the best chiropractors Logan, Utah has to offer. Call (435) 792-9400 to speak with one of our receptionists. When your spinal function is restored, muscle imbalance, tension, and stress can be relieved and improved nerve function that will improve health. Our approach to chiropractic care is done within the context of our expertise in medical pain management and with the combined efforts of our chiropractor, nurse practitioner, and licensed physical and massage therapists. We provide you with holistic treatment to help you achieve your best health. Call us today to set up an appointment with our professionals at Spring Creek Medical Center and our Logan, Utah chiropractor. We can get your health to the level you want and need it to be! Our office is just minutes away from downtown Logan, UT. Walk-in, call or contact us on our website today! Meet the Team – See what makes Spring Creek Medical great! Testimonials – Find out what our past customers think about us!